Protesters in Louisiana are locking themselves to construction equipment and sitting in trees in a last-ditch effort to stop the construction of a new crude oil pipeline. 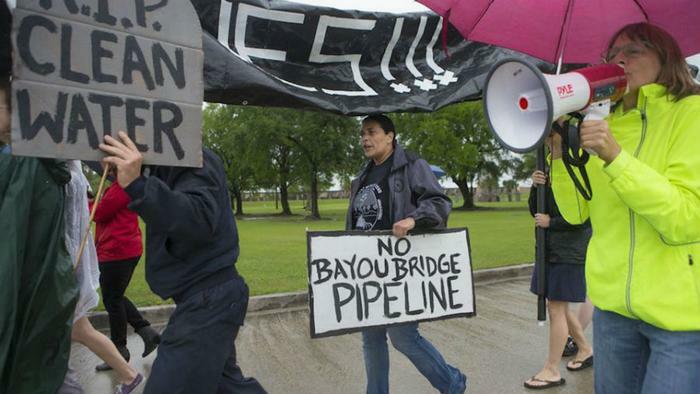 The Bayou Bridge pipeline, a 163-mile project meant to link Texas refineries to Louisiana’s Gulf Coast, is nearly complete, despite numerous open legal challenges being waged against it in court. The protest camp, a small, decentralized group calling themselves, “L'eau est la vie” (French for “water is life,”) has shared footage online that documents how activists are kayaking through swamps to block equipment, among other drastic steps to stall construction. "I think the direct actions are holding the place” for the pending lawsuits, says Cherri Foytlin, an organizer with the Indigenous Environmental Network and the protest camp’s Indigenous Women’s Council. The L’eau est la vie group, a collection of environmentalists from indigenous, black, and rural white communities, says that its efforts have “successfully shut down construction” of the Bayou Bridge pipeline, if only temporarily. On Thursday, L’eau est la vie announced that three protesters kayaking through a swamp near construction were “abducted” by private security contractors and later arrested by the Iberville Sheriff’s Department, which has yet to return a message left by ConsumerAffairs. And last week, the group said that an armed worker threatened that someone could get “hurt” if protests continued. Foytlin, the organizer, tells ConsumerAffairs that the instances are relatively isolated. She describes the majority of workers as either apathetic or quietly supportive of the cause. "There's been occasions where the workers will bring us something to drink. They don't hate us as much as the companies would like people to think,” says Foytlin, who is based in Rayne, Louisiana and has family who works in the oil industry. The industry has such a strong hold on the community, she says, that even workers who would otherwise be opposed to construction don’t have much of a choice if they want to put food on the table. The camp dates back to April of last year, and Foytlin counts a total of 80 civil disobedience-style “actions” that protesters have taken. Direct actions to physically block the pipeline’s construction began in July, according to Unicorn Riot, a nonprofit news outlet that sent its reporters to the protest encampments. Several weeks later, the oil and gas pipeline magante Energy Transfer Partners acknowledged that tree-sitters were staging protests in the pipeline's path. “We have notified local law enforcement [that] anyone in a tree sit is trespassing on our right-of-way,” the company said. When Foytlin talked to ConsumerAffairs on Wednesday, she was on her way to bail a protester out of jail who, along with others, had crashed the annual American Legislative Exchange Council (ALEC) meeting in New Orleans. ALEC, a nonprofit backed by corporations in the energy sector and other industries, has a well-documented history of drafting legislation to suit members’ business interests. For pipeline protesters, the ALEC meeting in New Orleans this week was especially personal. In Louisiana, a recent report by the non-profit Common Cause says that ALEC ghost-wrote a new state law that criminalizes oil and gas pipeline protests. Under HB 727, people in Louisiana accused of “conspiring” to trespass on a pipeline easement or damaging construction equipment in the easement now face anywhere from one to 20 years behind bars if they are prosecuted. The law went into effect just last week. The L'eau est la vie camp has since adjusted their strategies to avoid violating the new legislation, Foytlin says. In one parish, a single tree-sitter has picked a location that is outside of the pipeline easement. However, should workers continue cutting other trees in the path, the tree-sitter is close enough that he could be killed, Foytlin says. The pipeline project is owned 60 percent by Energy Transfer Partners, the same company behind the Dakota Access Pipeline in North Dakota. Phillips 66 owns the other 40 percent. The Bayou Bridge website points to a poll conducted by Louisiana’s local oil and gas association, claiming that 74 percent of people in the state support new oil pipeline projects. “If there are persons currently in any of the tree sits, we encourage them to come down and leave the area,” the firms said in July. How another pipeline came to "Cancer Alley"
The United States Army Corps of Engineers ruled in December that the project would have “no significant impact" on the local environment. The pipeline also got the green light from Louisiana's Department of Natural Resources and from the 11 parishes that it crosses through. That includes St. James Parish, a town 50 miles west of New Orleans that received the nickname “Cancer Alley” due to anecdotal reports describing high rates of cancer among the town’s 22,000 residents. Researchers, officials, and industry leaders disagree about whether there is, in fact, a cancer cluster. But there’s no disputing that the town is already home to numerous petrochemical plants and petroleum refineries. “Almost all of the industry is in the poorer black neighborhoods,” says City Councilman Clyde Cooper. That factor appeared to affect how the pipeline won local approval. In the St. James Parish last year, the City Council members voted along racial lines, with the white council members who were supportive of the pipeline project narrowly defeating the black opponents in a 4-3 vote. Nonetheless, locals are still attempting to stop the project. A group of St. James residents, represented by attorneys who work in the environmental clinic in Tulane University’s law school, recently sued the state’s Department of Natural Resources for permitting the project without requiring an evacuation plan in the event of a fire or other catastrophe. The residents won a surprise legal victory in May, when a state judge sided in their favor, ruling that the Bayou Bridge pipeline was operating under an illegal permit. But the Department of Natural Resources declined to halt construction, explaining that it doesn’t agree with opponents’ interpretations of the permitting laws. The town’s poor and industrial neighborhoods are only accessible via a single access road, something that Councilman Clyde Cooper says already puts residents at risk. In a recent newspaper editorial, Cooper described how paramedics were unable to take a woman suffering a heart attack to the hospital for nearly an hour because their helicopter landing spot was locked behind private industry property. “There is no dedicated evacuation route in the event of an industrial spill, explosion, chemical release, fire or other emergency,” Cooper wrote. In an interview, Cooper tells ConsumerAffairs that he and other local lawmakers are trying to obtain commitments from the many companies that do business in the area, including Energy Transfer Partners, to develop an emergency evacuation plan so that residents who depend on the access road to leave town won’t get trapped. Federal law allows utility companies to build through private property and seize it if necessary via eminent domain, advantages that oil and gas pipeline operators like Energy Transfer Partners have often used in recent years. Last month, a Virginia resident sued the Bayou Bridge firms, saying that the companies began construction on his family’s property in Louisiana without bothering to follow through on the eminent domain process. The lawsuit claims that after his family rejected Bayou Bridge’s initial financial offer in exchange for a partial easement, workers began clearing trees and digging trenches through the family property without a court order. The lawsuit echoes similar concerns voiced by landowners in Texas, who have described feeling steamrolled by construction work that began prematurely in yet another pipeline project financed by Energy Transfer Partners. Even the agencies that cleared the project have acknowledged that some of the the work is not going completely smoothly. In March, the United States Army Corps of Engineers said that they were investigating concerns that Bayou Bridge had violated various conditions of its federal permit regarding construction practices. In response, the state of Louisiana’s Department of Natural Resources acknowledged three instances in which Bayou Bridge was found to be “out of compliance” during the construction process. And earlier this year, a federal judge ordered pipeline construction to be halted, siding with arguments made by environmental NGOs that the Corps of Engineers did not adequately consider the pipeline’s impact on wetlands. But an Appeals court later overturned the ruling. Despite the unsettled legal issues, pipeline construction is nearly complete thanks to a regulatory system that allows energy companies to get expedited approval for oil and gas pipelines, an apparatus that was put in place under the Obama administration. Foytlin, the organizer, argues that opponents have made strong legal cases in the courts, though the protest camp is not involved with the lawsuits. In the meantime, she says that she is proud of the work that protesters on-the-ground have done. “Over the past month we have carried out four lock-down actions that shut down horizontal drill sites for the Bayou Bridge Pipeline,” L'eau est la vie organizers wrote in a post last week.